Canon continues to apply research into the field of stacked sensors with this latest patent application. 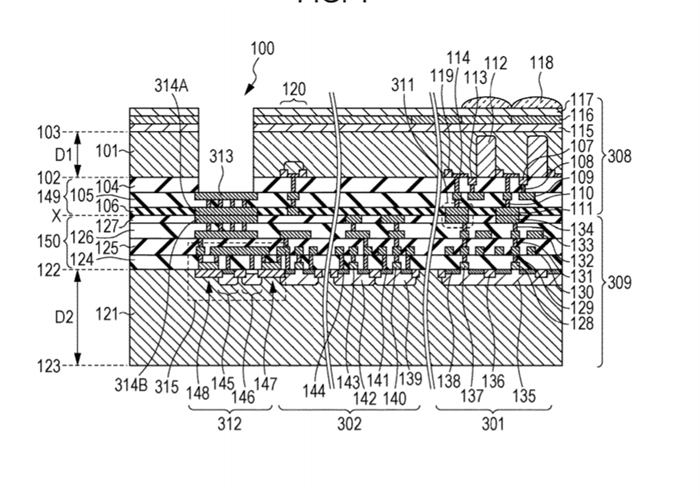 Add this patent application to the growing pile of stacked sensor patents we have discovered. In PTL 1, a solid-state image pickup device has been disclosed in which in a CMOS type solid-state image pickup device, which is an amplification-type solid-state image pickup device, in order to ensure a light receiving area of a photoelectric converter, a first substrate provided with photoelectric converters and transfer transistors and a second substrate provided with other circuits are bonded to each other. In addition, in the solid-state image pickup device disclosed in PTL 1, a technique has been disclosed in which copper bonding pads are used when the first substrate and the second substrate are bonded together, and an insulating film around the copper bonding pads of the second substrate is recessed. Why are stacked sensors so important, and why would it be such a good thing for Canon to come out with them? A stacked sensor allows Canon to place the electronics of the sensor in one substrate, and the light receiving portion of the sensor in another and bond them together. This makes life easier for the sensor designers because they don't have to worry about the electronics on the light receiving substrate, which allows it to be far more efficient. It also allows your sensors to be faster, and have more processing that can occur because you have much more freedom to what you put on the electronics substrate then you would if it the sensor was just one substrate. However, the downside to such a sensor is an increased cost to fabricate. A stacked sensor would cost over twice as much to fabricate because you have to fabricate the upper and lower layers of the sensor and with an extreme amount of precision bond them together.